Domain analysis is the process of studying the actions, knowledge production, knowledge dissemination, and knowledge-base of a community of commonality, such as an academic discipline or a professional community. The products of domain analysis range from controlled vocabularies and other knowledge organization systems, to scientific evidence about the growth and sharing of knowledge and the evolution of communities of discourse and practice.In the field of knowledge organization- both the science and the practice­ domain analysis is the basic research method for identifying the concepts that will be critical building blocks for knowledge organization systems. 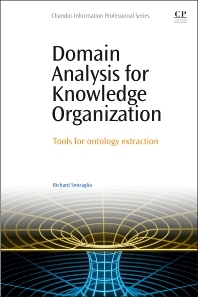 This book will survey the theoretical rationale for domain analysis, present tutorials in the specific methods of domain analysis, especially with regard to tools for visualizing knowledge domains. Richard Smiraglia is a Professor in the Knowledge Organization Research Group at the iSchool, University of Wisconsin, Milwaukee, USA. He has defined the meaning of "a work" empirically, and has revealed the ubiquitous phenomenon of instantiation among information objects. Recent work includes empirical analysis of social classification, and epistemological analysis of the role of authorship in bibliographic tradition. His "Idea Collider'' research team is working on a unified theory of knowledge. An Associate Researcher of the eHumanities Group, Amsterdam, he is a collaborating member of the Knowledge Space Lab effort to map the evolution of knowledge in Wikipedia. He holds a PhD (1992) from the University of Chicago. He is editor-in-chief of the journal Knowledge Organization.